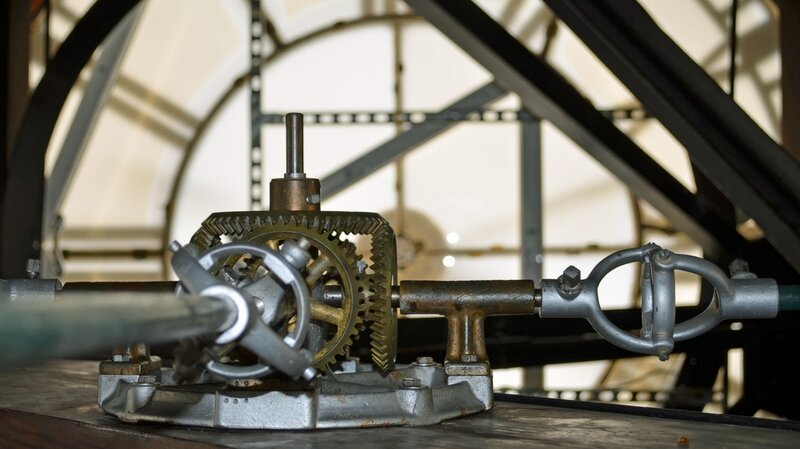 "In 1849 Bvt. 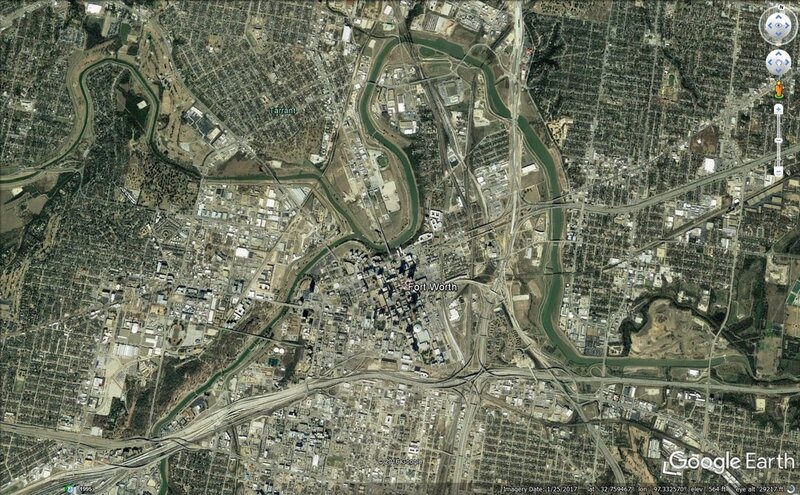 Maj. Ripley Arnold chose a site at the confluence of the Clear Fork and West Fork of the Trinity River. 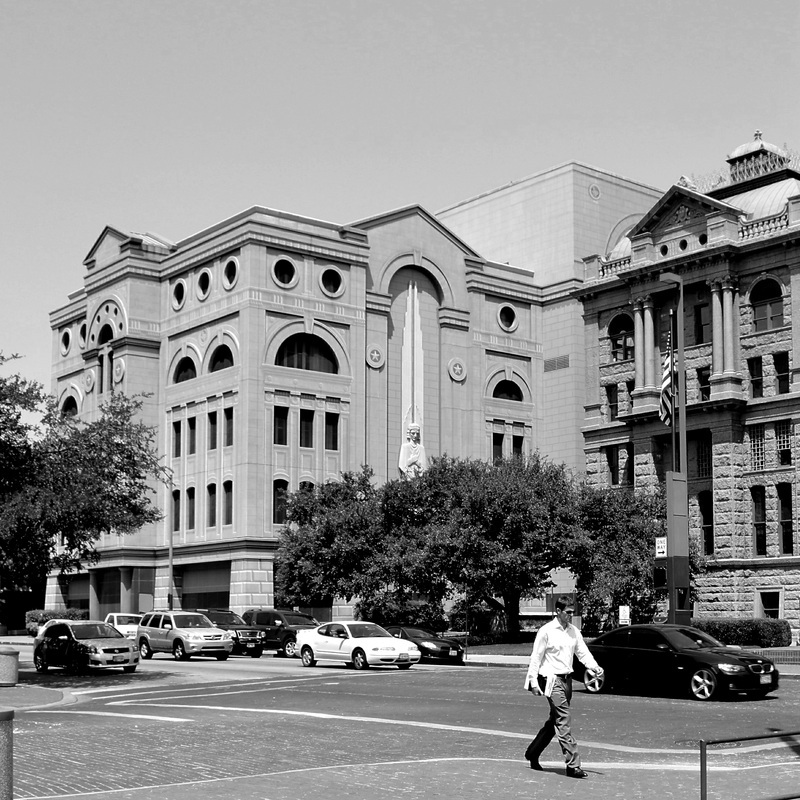 He named the post Camp Worth in honor of Gen. William Jenkins Worth, who had won fame in the Mexican War, and the camp was officially named Fort Worth. 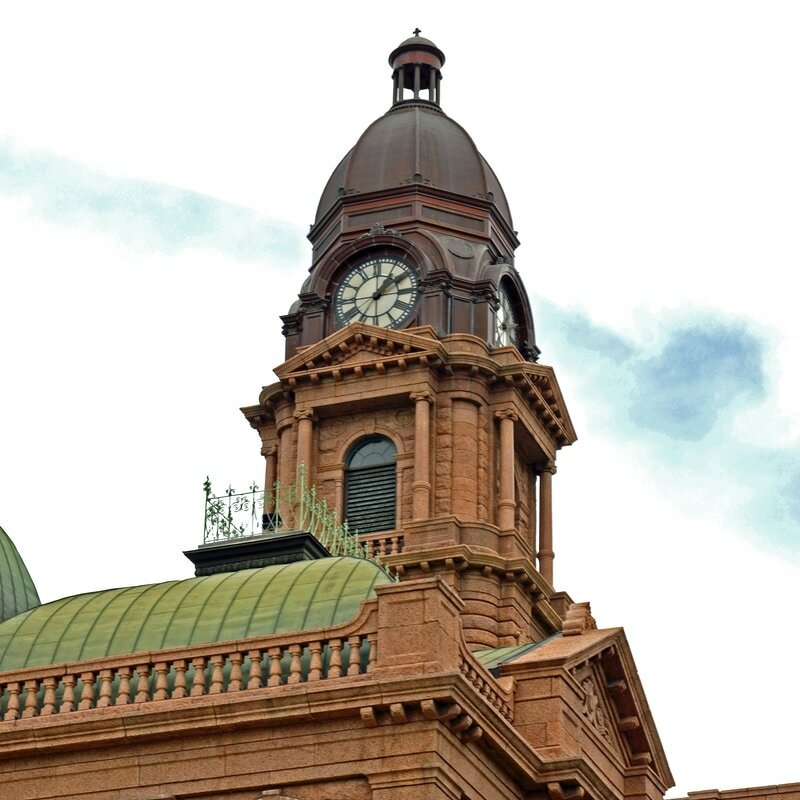 The Texas legislature recognized the importance of the area. 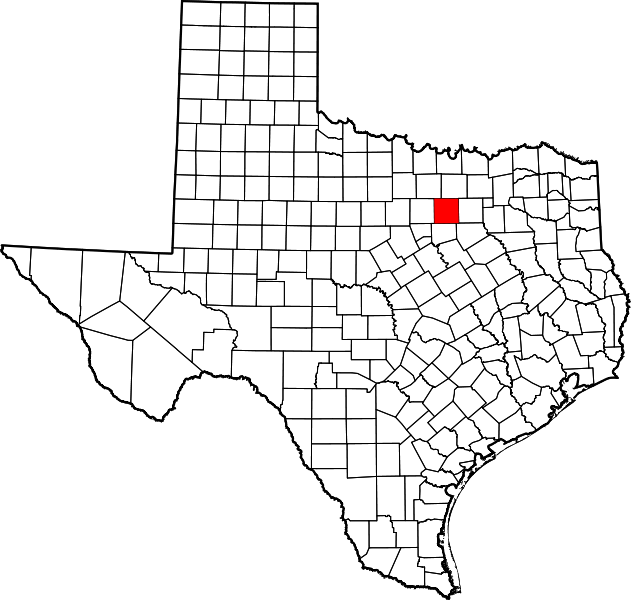 On December 20, 1849, the county was founded and named after Gen. Edward H. Tarrant, who had been instrumental in driving out the Indians. 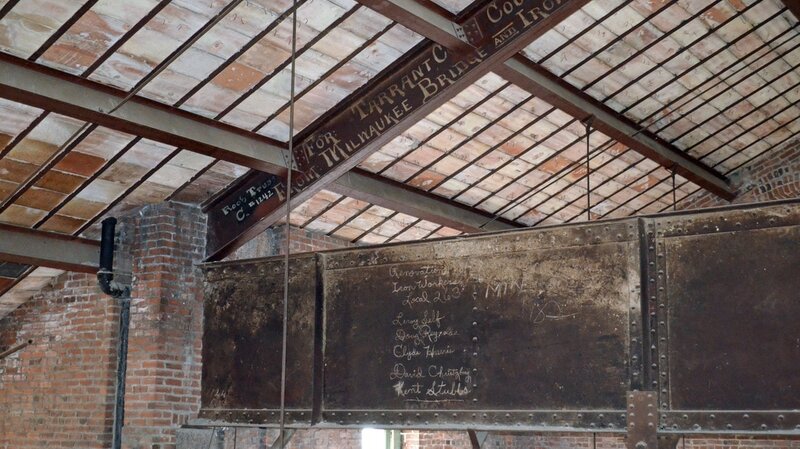 It was formally organized in August 1850, when the first elections were held. 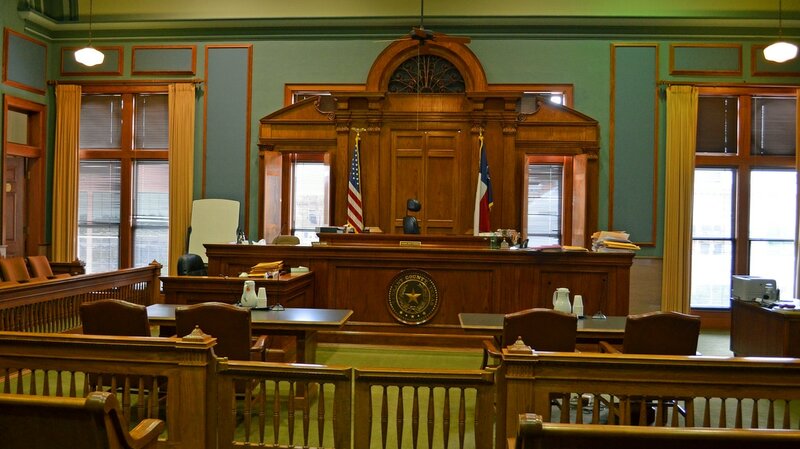 "When Tarrant County was organized, Birdville was designated the county seat. 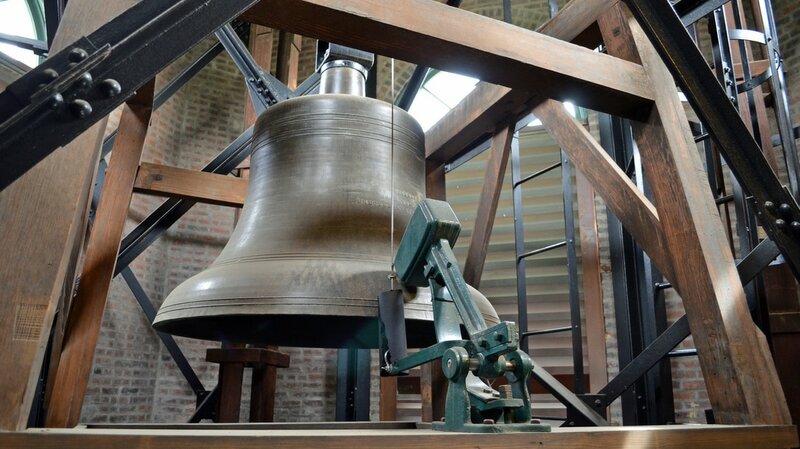 That decision was soon questioned by influential citizens of Fort Worth ... 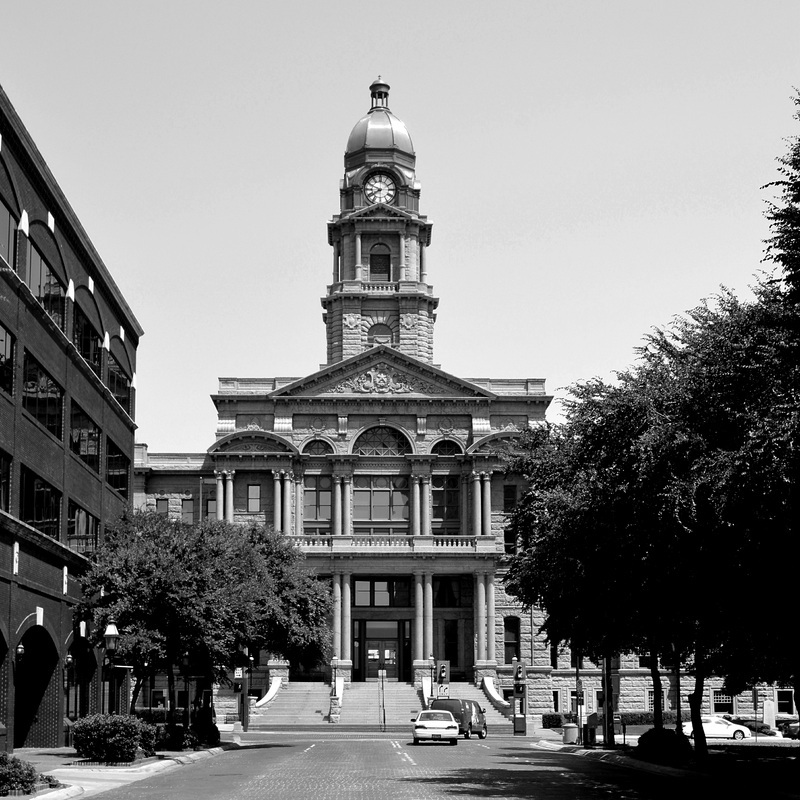 These efforts resulted in a special election in 1856 in which Fort Worth won by a narrow margin." 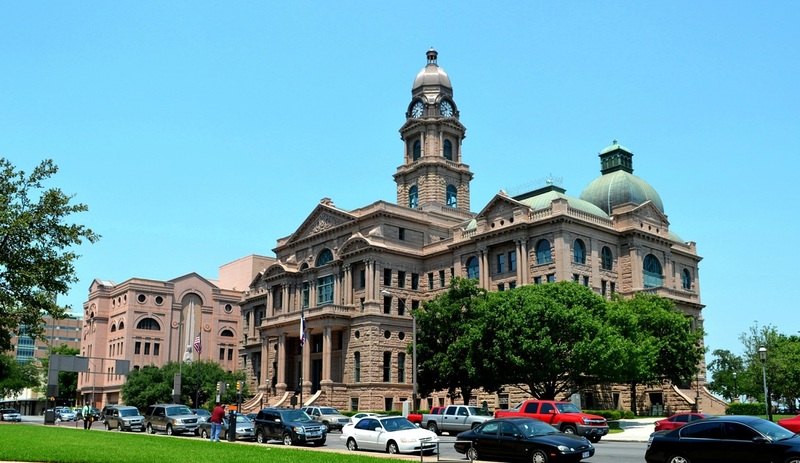 "In 1893, the County Commissioners Court voted to spend $500,000 in the construction of a new courthouse. 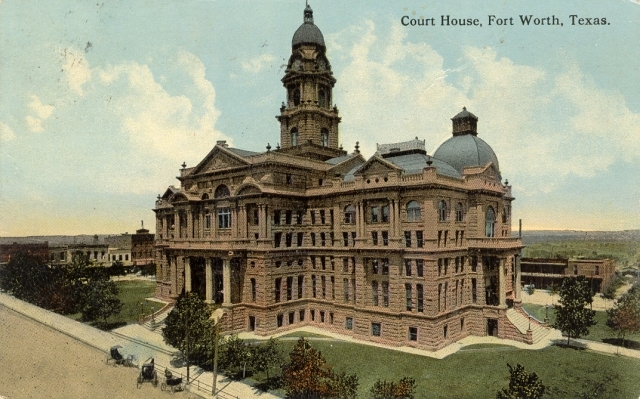 The size and elegance of the building reflected Fort Worth's increasing wealth of the 1880s and 1890s. 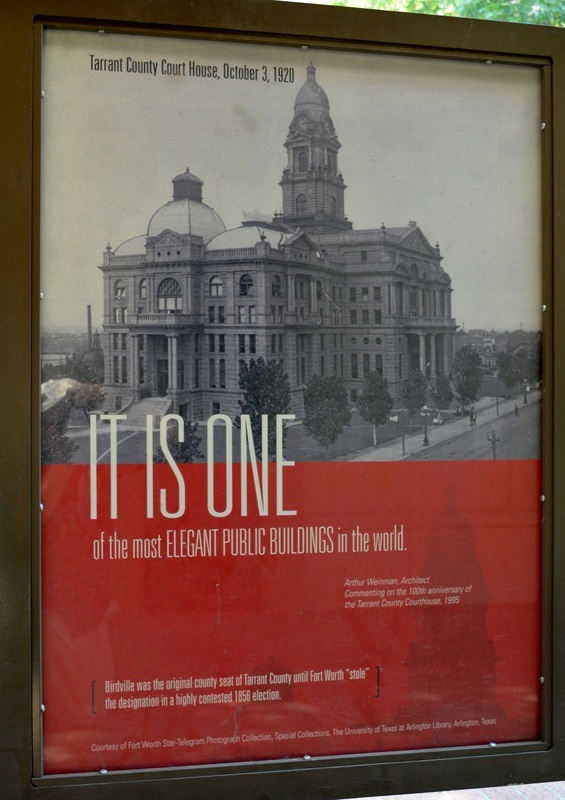 The Commissioners hired Kansas City architects Gunn and Curtis; they placed the construction contract with Probst of Chicago. 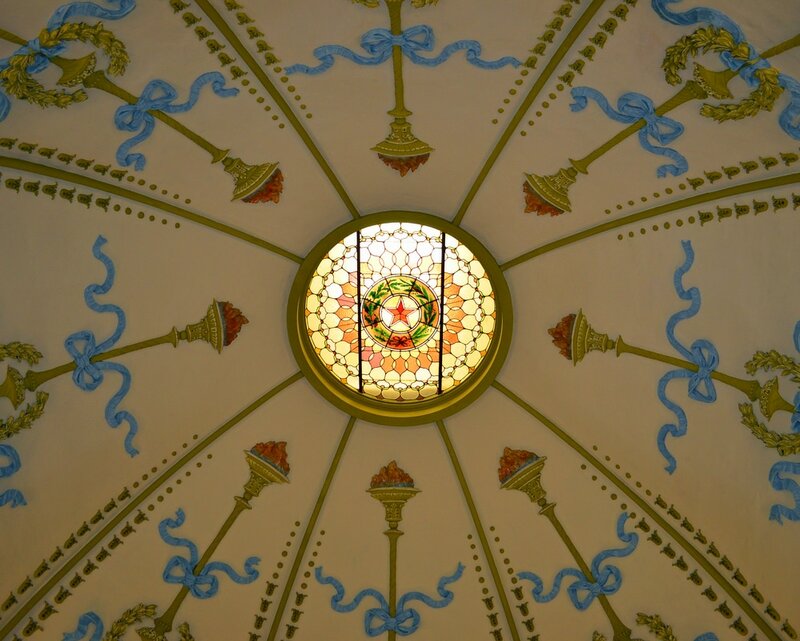 Work began in 1893, and ended in 1895 with a domed Renaissance Revival building of red Texas granite. Citizens were so scandalized by the immensity and cost that they voted every member of the Commissioner's Court out of office at the next election. " 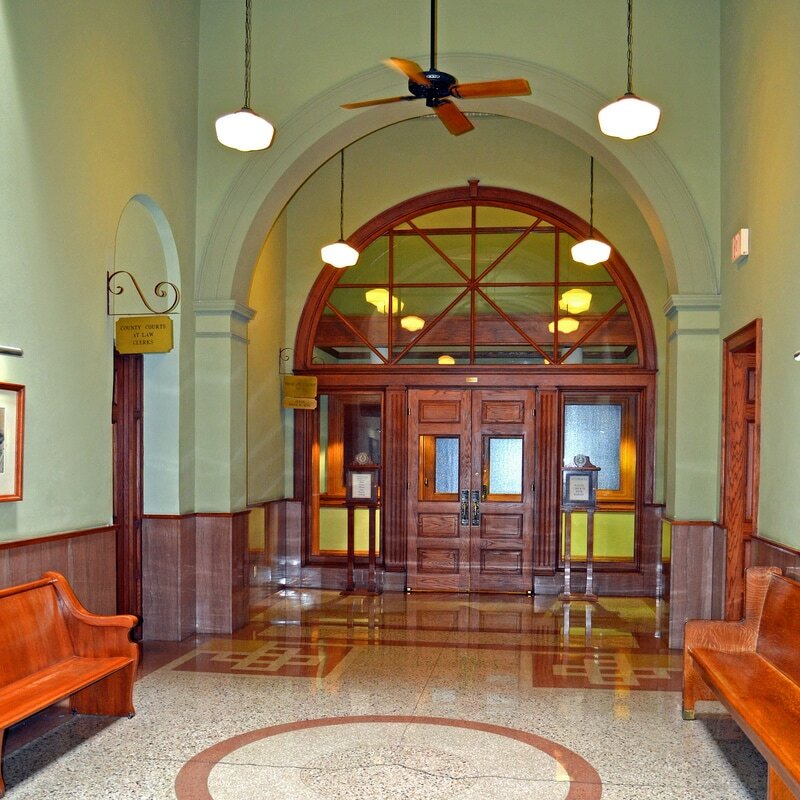 I visited the county and photographed the courthouse on October 24, 2008, June 2, 2010, June 27, 2012, and April 8, 2016. 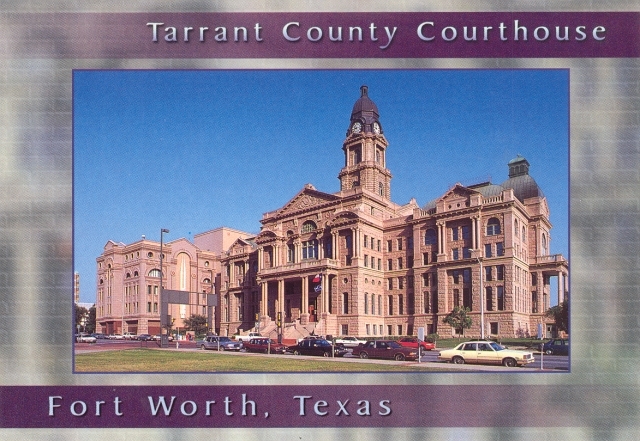 Tarrant County is one of seven Texas counties I've lived in over the years. 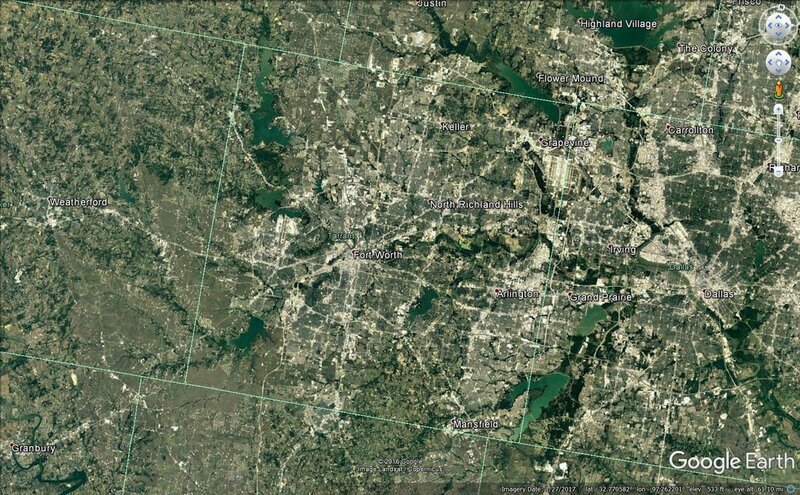 My family lived in the Ridglea Hills area of Fort Worth in 1961-62. 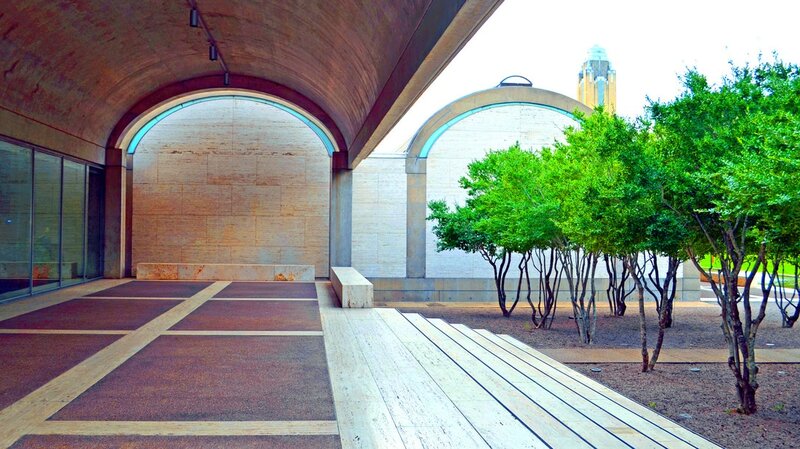 Fort Worth is one of my favorite Texas places and home to my favorite building: the Kimbell Art Museum. 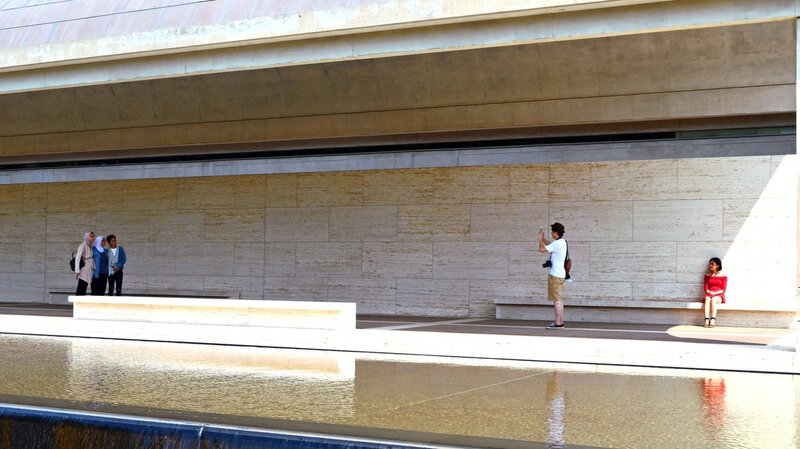 And, let's not forget the Fort Worth Water Gardens. 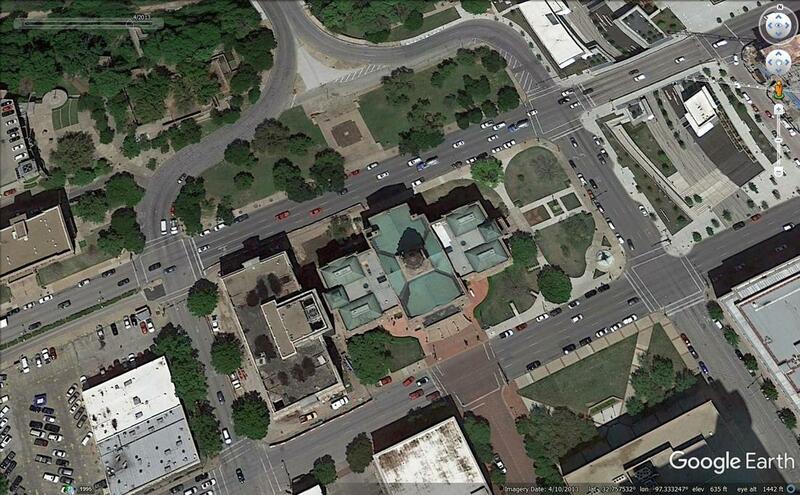 Tarrant County courthouse, circa 1939, courtesy TXDOT. 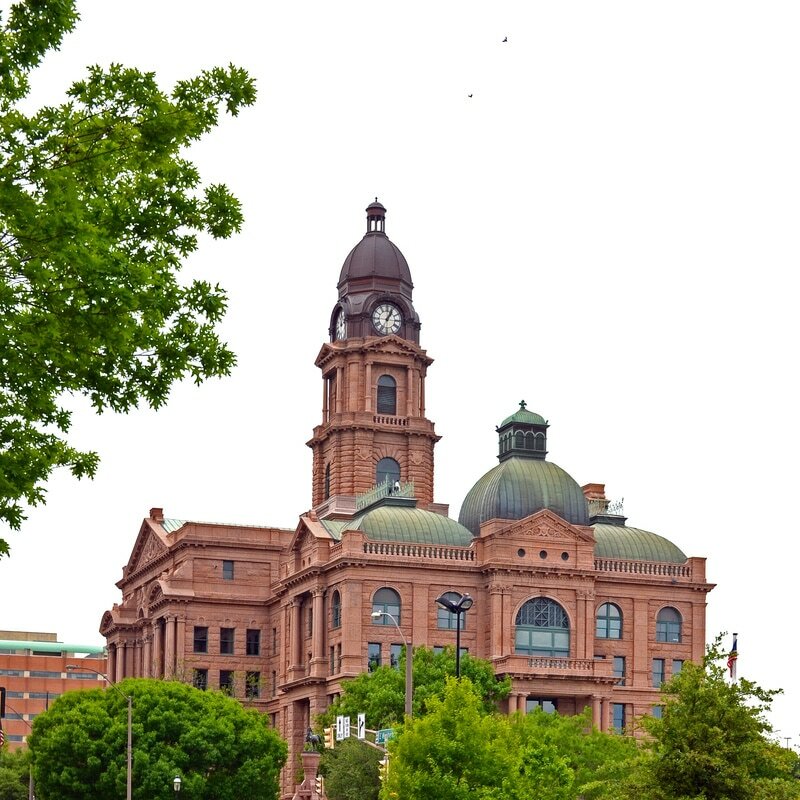 "A four story red Texas granite structure with central and end pavilions with central clock tower capped by a domed lantern. 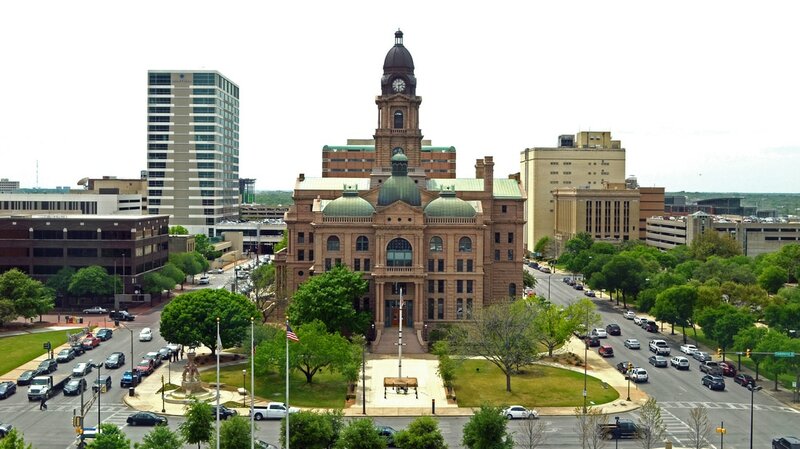 The style is Renaissance in derivation and the sides and back of the building are very much like the Texas State Capitol. 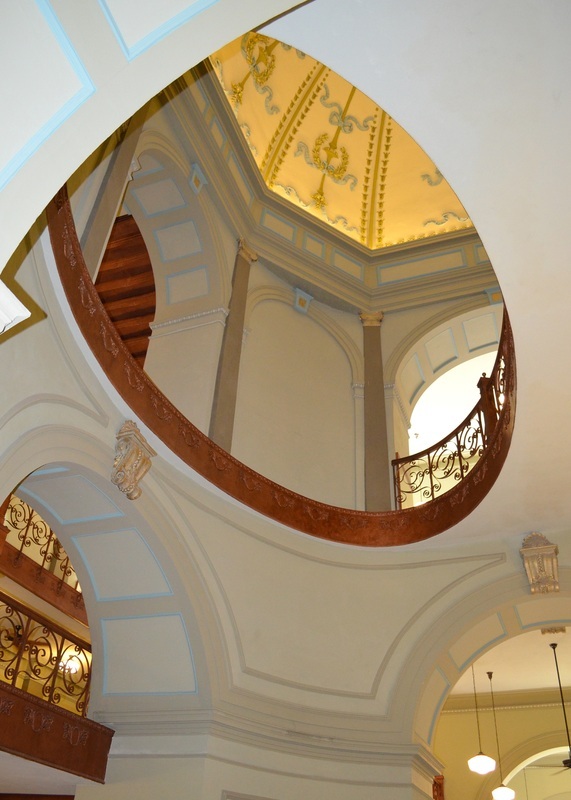 The main front pavilion, however, is more ornate and Venetian than the State Capitol, with slender paired columns and Ren-aissance pediments and entablatures. 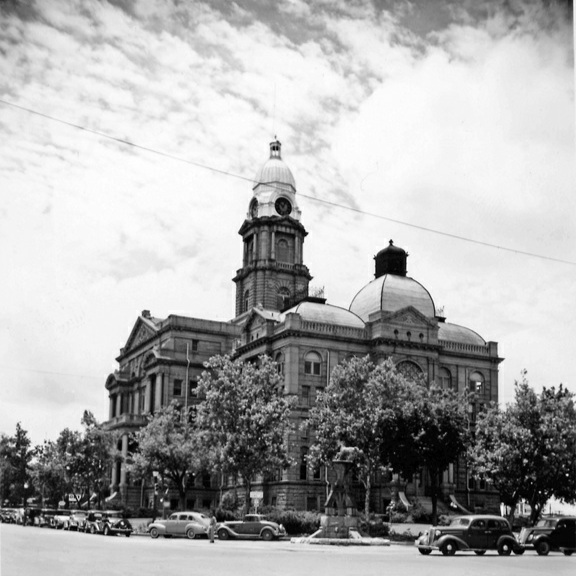 Tarrant County added a new Civil Courts building on the west side of the historic courthouse in 1958. 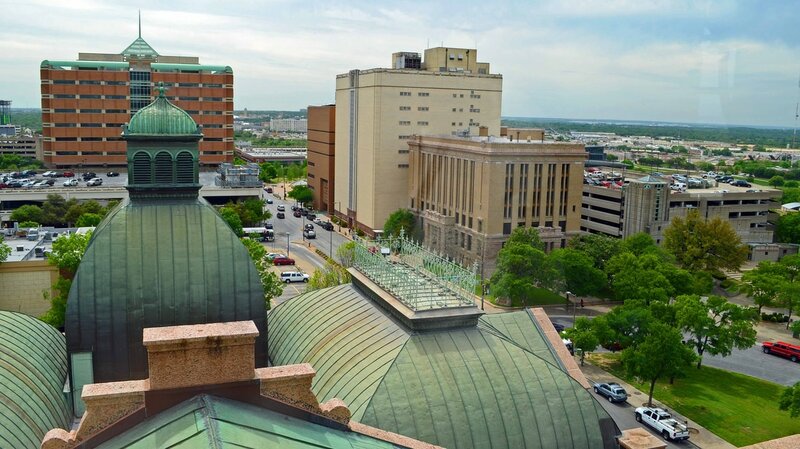 Architect ​Wyatt Hedrick designed the new building in a contemporary style, albeit symmetrically aligned with the adjacent courthouse. 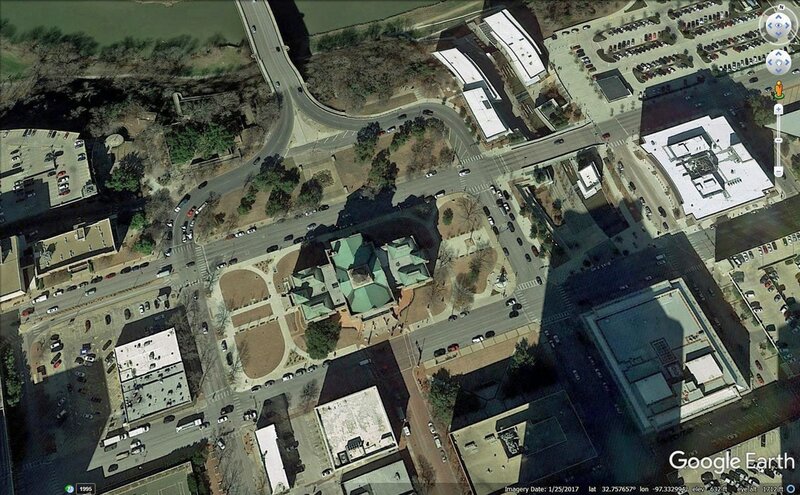 The location of the new courthouse was inappropriate, to say the least. 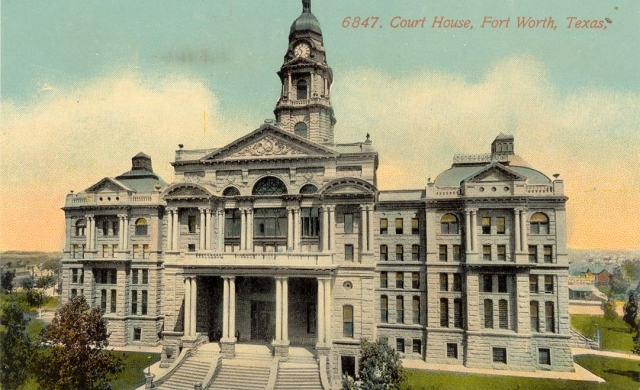 South facade of the Tarrant County courthouse, Fort Worth, 1895. 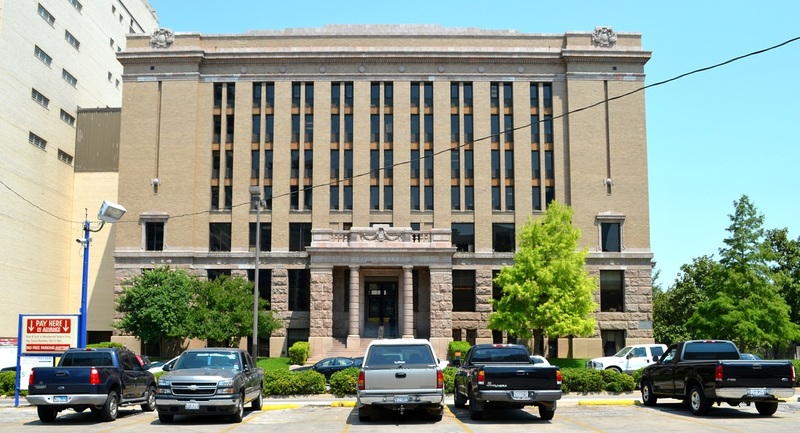 Main Street facade of the courthouse. 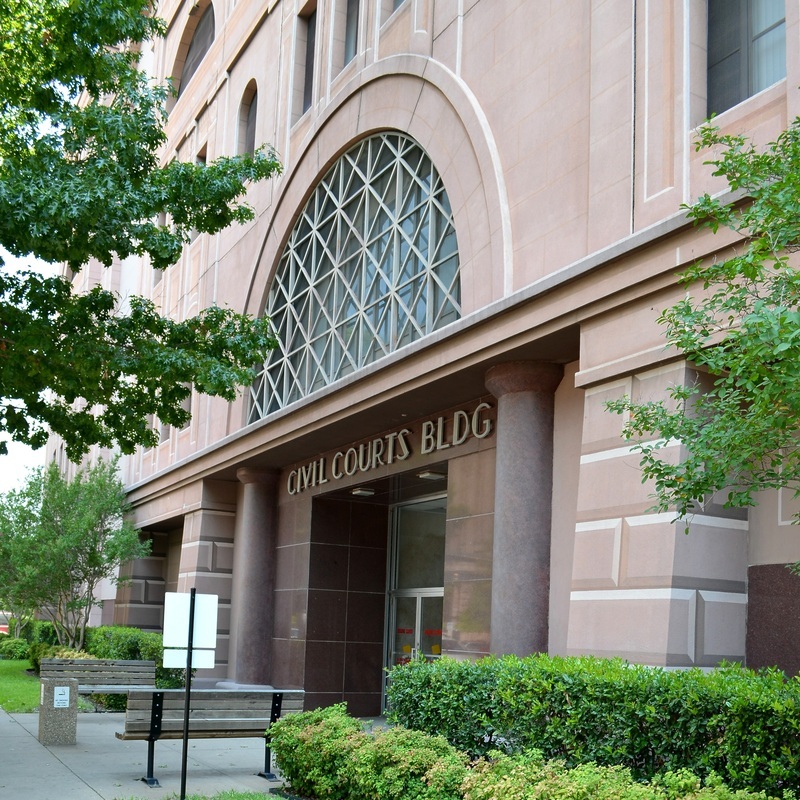 The Civil Courts Building was re-skinned in the 1980's, in a faux historic style. 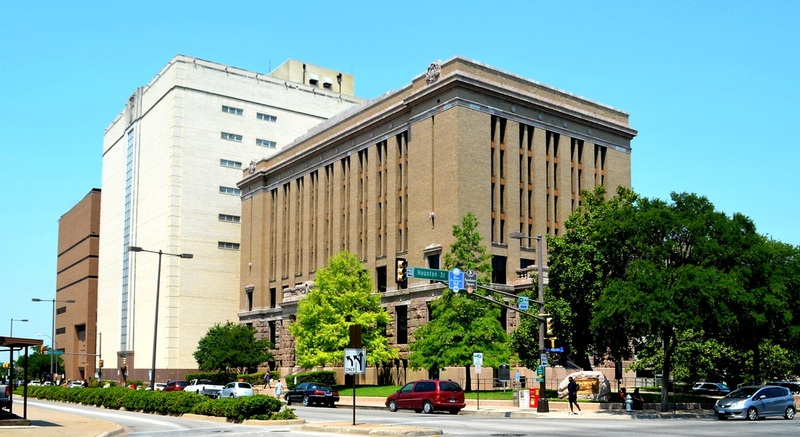 View of the historic courthouse and the civil courts building from the southeast. 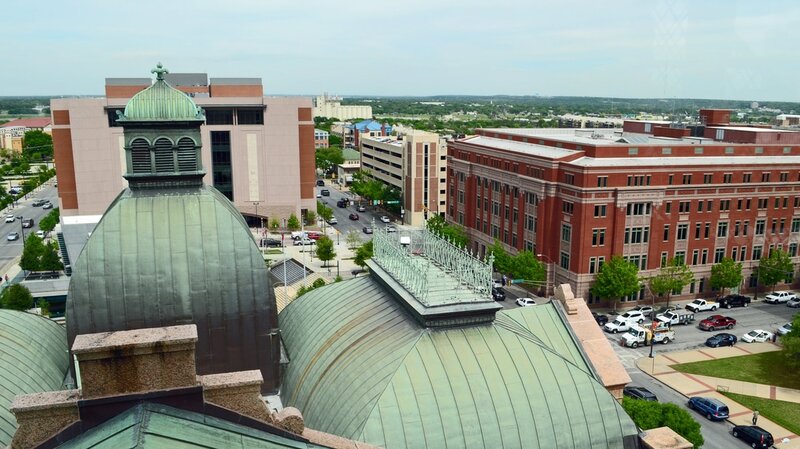 Looming behind the courthouse are the City Center Towers, designed by architect Paul Rudolph in the early 1980's. 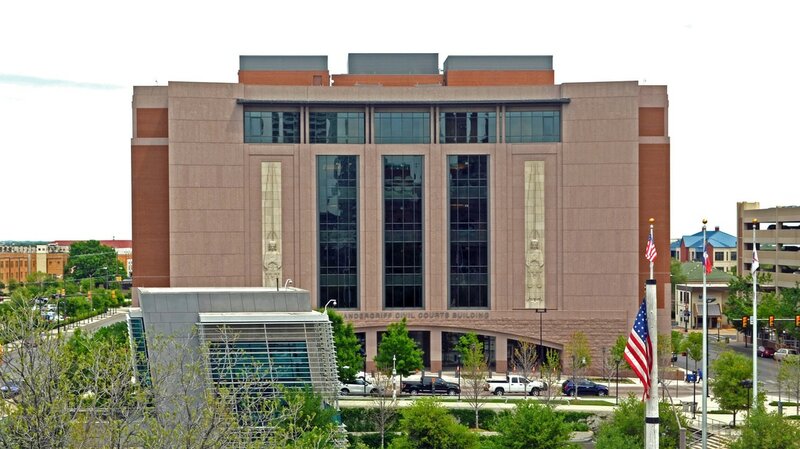 Tarrant County Civil Courts Building, west facade. 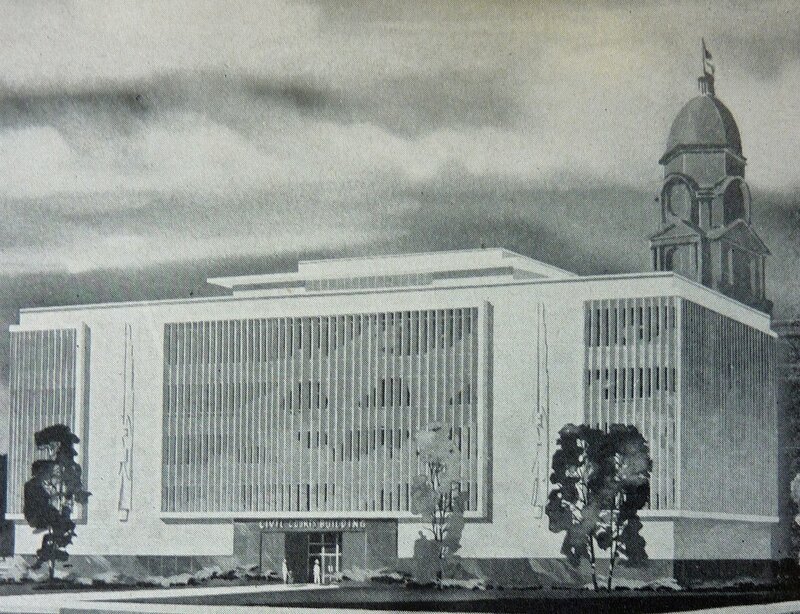 The "post-modern" version of the Civil Courts building couldn't change its poor siting. 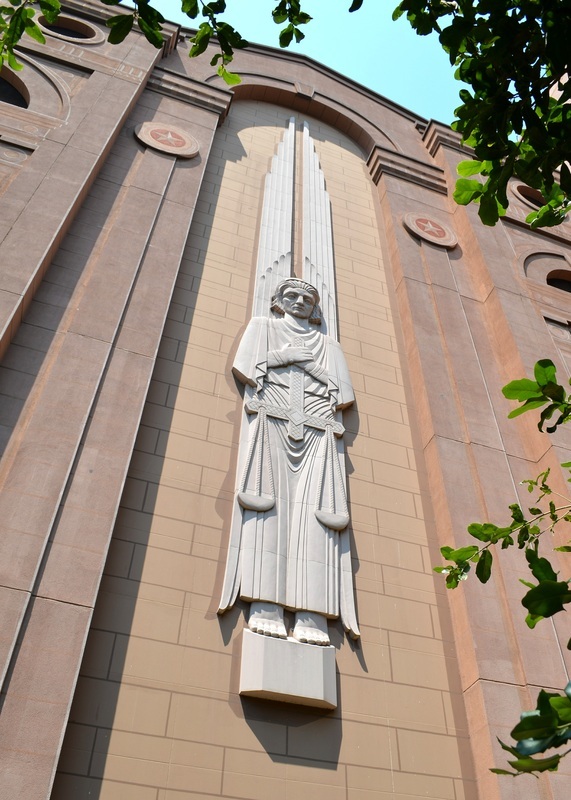 Justice represented as a religous icon on the east side of the Civil Courts Building. 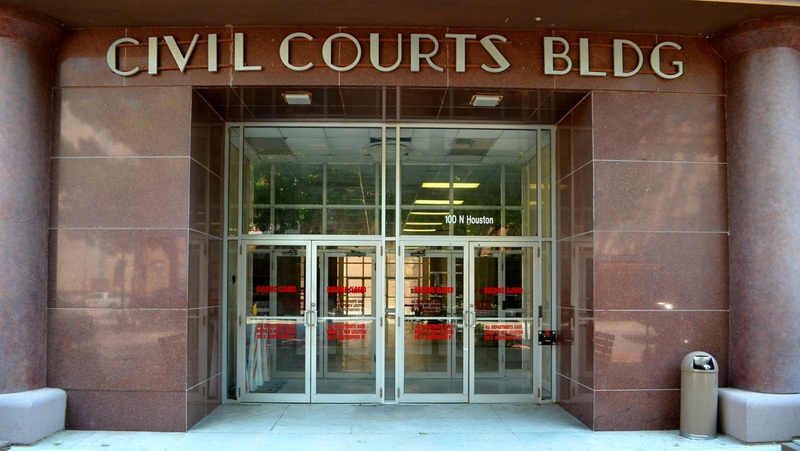 West entrance to the Civil Courts Building. Not so fast. 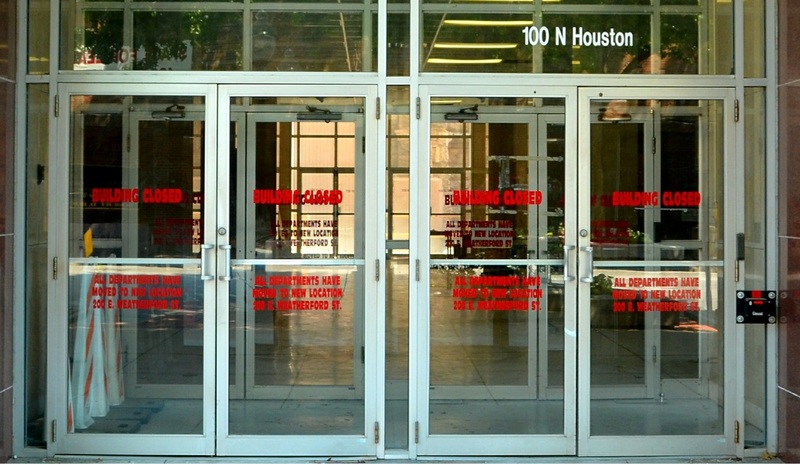 The building is CLOSED. 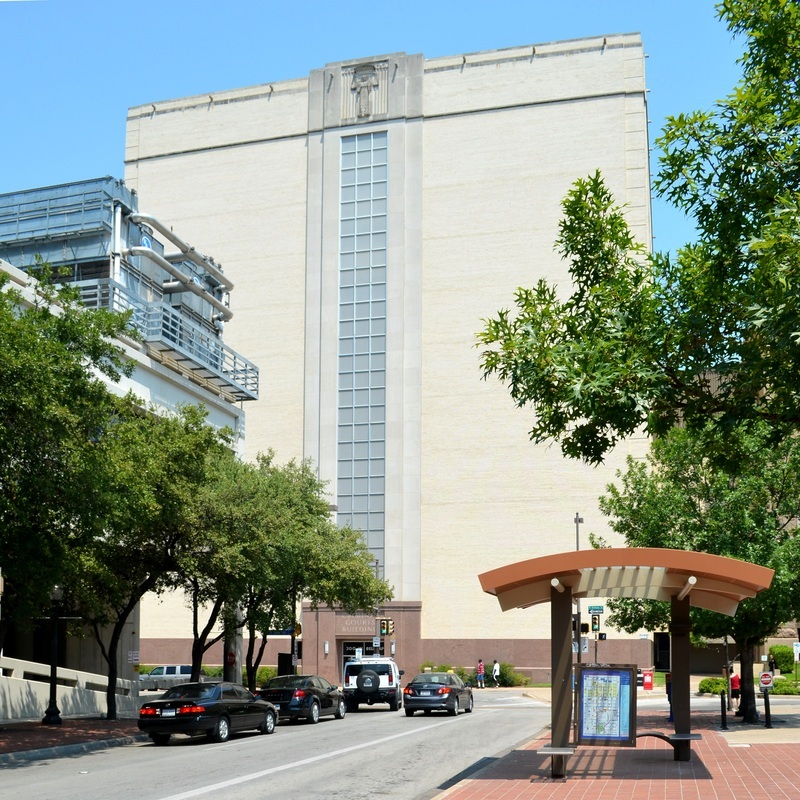 Thankfully, Tarrant County corrected the 1950's mistake of placing the Civil Courts building on the west side of the courthouse square: in 2014-5 the building was demolished and replaced by a new Civil Courts building, located two blocks east of the historic courthouse. The new Civil Courts building, by HOK. 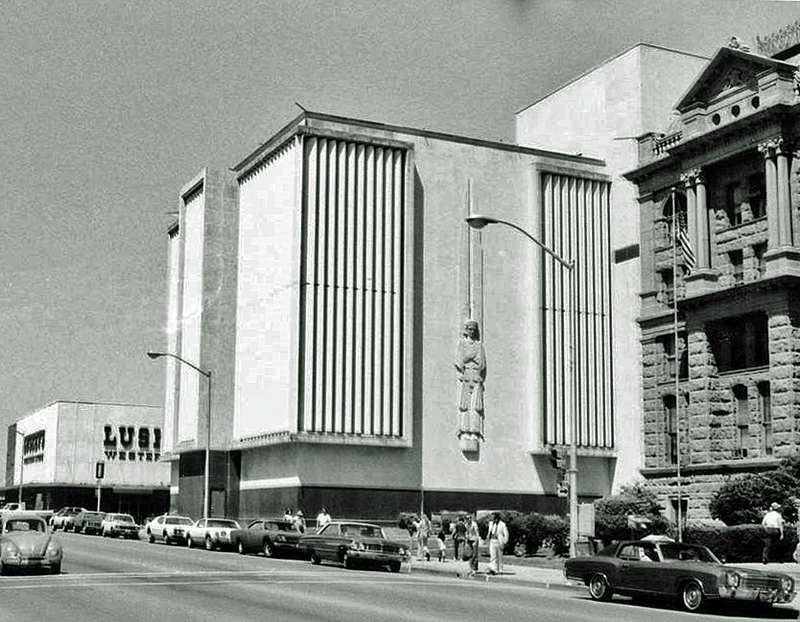 The bias-relief sculptures are from the 1958 building. 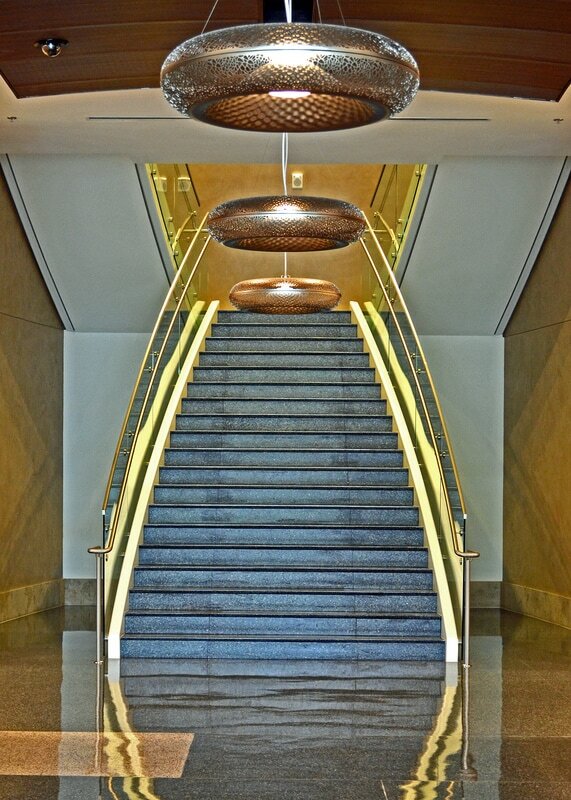 A stairway in the new Civil Courts building. 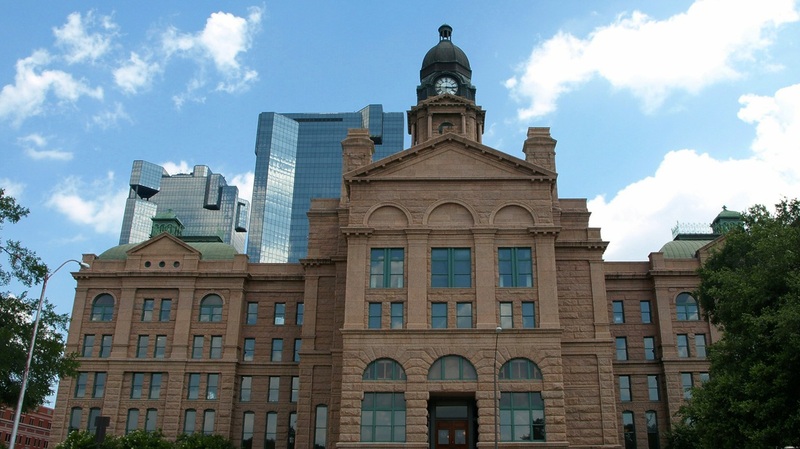 The east facade of the historic courthouse, viewed from the Civil Courts building. 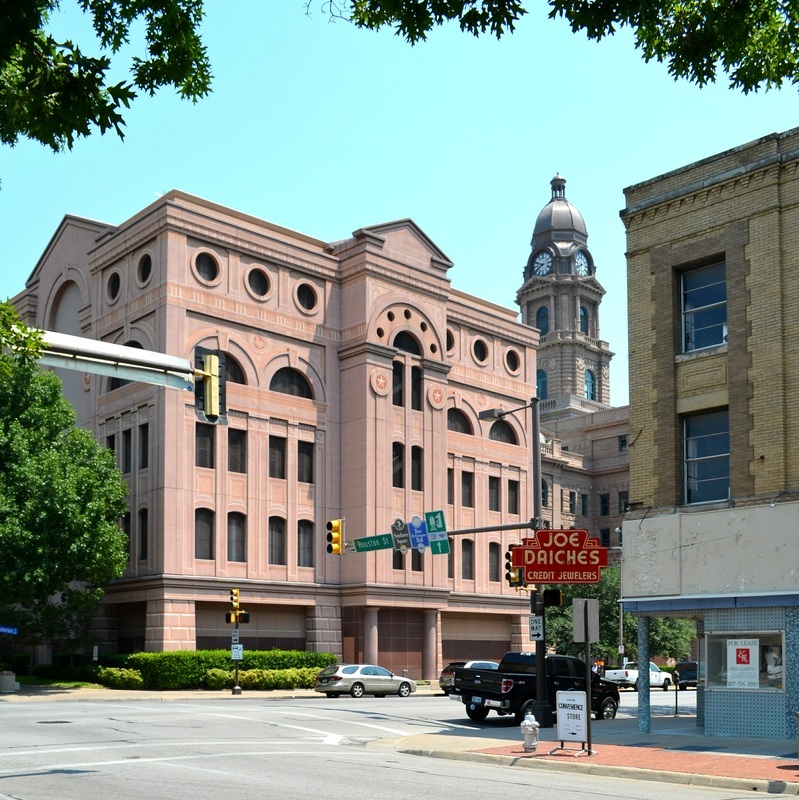 The west facade of the historic courthouse is once again visible! 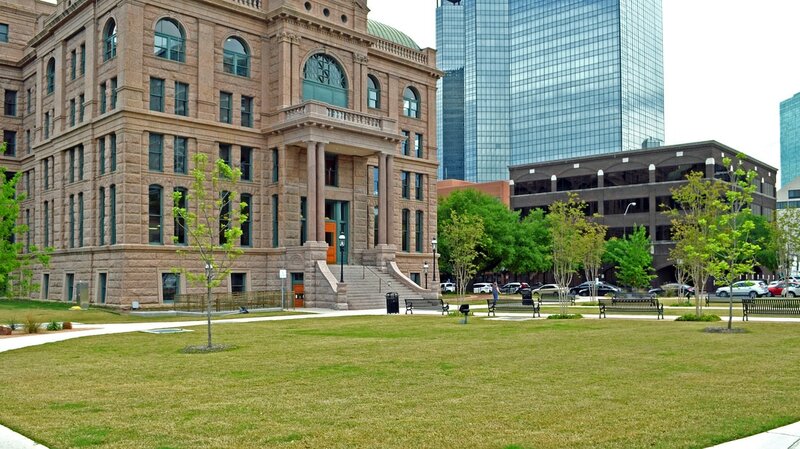 This lawn on the west side of the courthouse square was the site of the 1958 Civil Courts building. 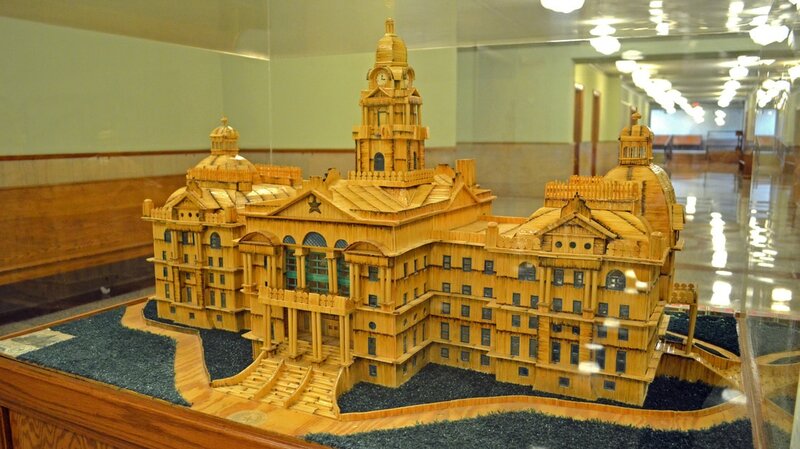 A model of the historic courthouse, made of matchsticks! 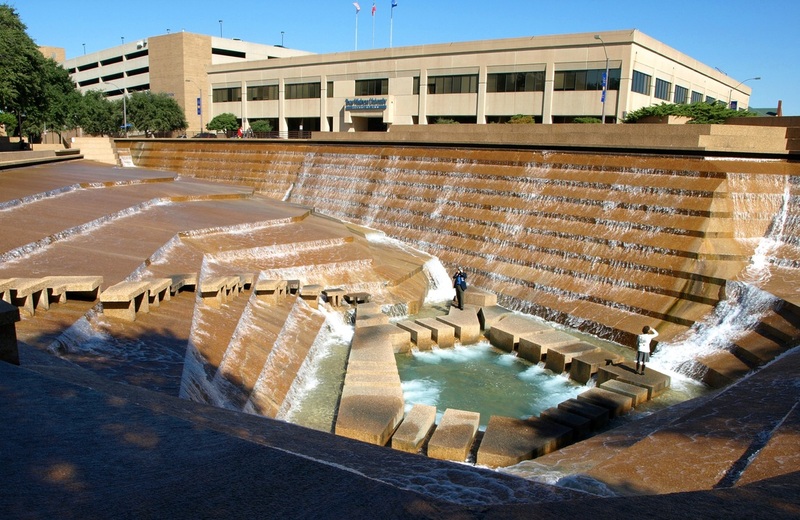 Architect Phillip Johnson designed the Fort Worth Water Gardens, completed 1974. 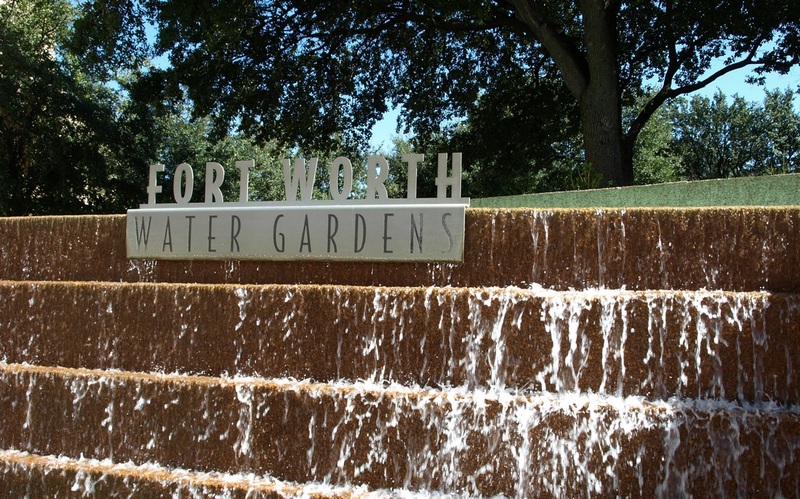 The project was funded by the Amon G. Carter Foundation of Fort Worth. 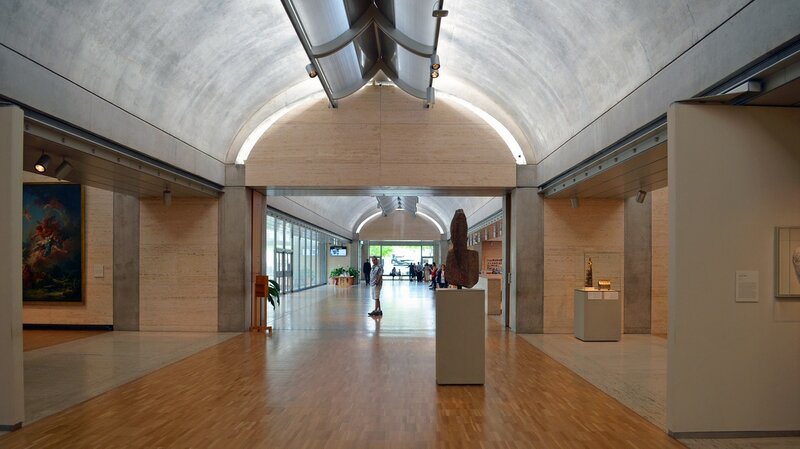 One of the finest 20th century buildings in the world, the 1972 Kimbell Art Museum, by Louis Kahn.